Bharath paper conversions is a renowned end protectors edge board manufacturer and supplier from india. Superior quality and durability are some of the hallmark of superlative products. 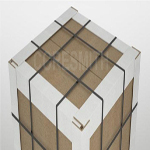 We provide all types of end protector edge board at the most affordable price.